Come and share my love of Yoga at a Group Class near you. My group classes are suitable for all levels. If you are ready to embrace life with a renewed connection to your body, mind and nourishment then this empowering practice is for you. Don’t have a Yoga + Meditation class at your gym? Ask your gym to contact me to schedule a class. Personal sessions can also be arranged. call me or see below for further information. Yoga + Meditation can fit around your lifestyle and deliver the physical and mental flexibility you need in today’s busy world. 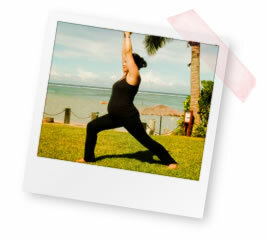 Personal Yoga + Meditation sessions are also available to suit your specific needs. Arrange a practice in the comfort of your own home/workplace that aligns with your home/work/life rhythm. If you’re a beginner - establish a personal sequence to help you get started, enjoy and commit to a regular practice. If you’re a regular practitioner – establish a series of sessions to build on your previous practices and take your personal experience to the next level. Incorporate yoga + meditation to provide therapeutic support in areas including pregnancy and birthing, healing from illness, basic back care and recovery from injuries. Complement your athletic and training programmes with flexibility and injury reduction in sports including, triathlons, weightlifting, martial arts, running, golf, tennis, cycling and swimming. Your personal Yoga + Meditation programme can be arranged on a weekly or casual basis according to your needs, time and resources. To discuss how Yoga + Meditation can help you, click here to book a personal session with me. I am a Nutritionist and Accredited Practising Dietitian (APD) dedicated to supporting you in optimising your health and wellbeing. For contact purposes only, your info is never stored or shared without consent. A short description for reason of contact. I have been practicing Yoga since 1993 and have been attending classes with Sharon for about 3 years. Sharon's style of teaching is unique and inspiring and every time I complete a class I feel a sense of focus and rejuvenation that makes a real difference to the way I approach life throughout that week. I look forward to every class and come away feeling as if I have made progress physically, mentally and spiritually every time. I felt confident and supported by Sharon to continue practicing Yoga throughout my second pregnancy and I feel much stronger as a result. I am now 35 weeks pregnant and feel its time to slow down and her classes have been invaluable. Why do I love yoga? Well let's start by saying that yoga has improved the quality of all parts of my life through its ability to get me back in touch with those true aspects of myself. Before attending Sharon's practice, I had tried yoga at other venues, which had some affect, however after the first class with Sharon I realised how yoga was going to benefit me and my family greatly in the future. This was attributed to how Sharon teaches, the practice, her manner, awareness of what each individual requires. All of which combines to make the experience so inspiring. I look forward to many years ahead of doing yoga with Sharon. Dear Sharon, Thank you for being a part of the inaugural Seven Media Group ‘Health + Wellness’ program. Feedback from the staff has been extremely positive on your sessions so I thank you for the time you provided our staff and the preparation you spent for your presentations. It is my hope that the staff retain the long term benefits that your teachings complement in their daily work life. I hope to be in touch to do it all over again! My best wishes. My teaching journey began with the cultivation of my personal practice and over 15 years of developing a multi-disciplinary approach under the guidance of renowned yoga masters Andrey Lappa (Universal Yoga), Shiva Rea (Prana Flow Yoga) and Baron Baptiste (Power Vinyasa Yoga). My classes support students from emerging to established practitioners in a collective flow that encourages the cultivation of inner awareness through deliberate breath, body and mind connection. I have expanded on my core yoga practice with a Bachelor of Nutrition and Dietetics to bring together my special interests in movement, meditation and nutrition. I am dedicated to integrating body-mind modalities and evidence-based clinical practice to help you optimise your health and wellbeing. I will need to call you in regards to appointments and info.